There are many reasons why fish is a popular staple in our diet. It’s nutritious, easy to cook, has enormous variety - and it’s fast. If we are aiming for healthy eating it is one of the best fast foods we could have. To keep the calories down though, we have to avoid deep-frying seafood in batter and teaming it with a mountain of chips. All fish is low in unhealthy, saturated fat and a good source of omega 3 fatty acids which are so important in a healthy eating lifestyle, protecting us from heart disease. As with all low calorie foods, cooking methods and portion sizes of seafood will help decide how healthy our diet is. White, non-oily fish like cod, haddock, halibut, monkfish and many more, are healthy fare, but not so rich in omega 3. They should still be enjoyed regularly in our diet. The oily fish which are richest in valuable omega 3 fatty acids include salmon, trout, herring, tuna, mackerel and sardines. Shellfish, too, are a good source of protein and are low in saturated fat. Avoid heavy sauces like mornay and hollandaise and, of course, deep frying. Steaming or boiling are healthy ways to enjoy prawns or crab, with simple dressings made from tomato-based sauces or reduced-fat mayonnaise. Mussels and clams can be cooked with carrots, celery, onion and a little white wine and served in their shells with the sauce that results. Another simple dressing to bring out the flavour of steamed or boiled crab or lobster and other seafood is a tablespoon of reduced-fat mayonnaise mixed with a tablespoon of fresh lemon or lime juice. When buying fish, allow roughly 170 grams of uncooked fish per person, which gives an average 168 calories when cooked. The healthiest, low calorie cooking methods are baking, steaming, grilling or sautéing. Fish can also be threaded on to skewers with vegetables for grilling or barbecuing. When you are stir frying, you use only a drizzle of oil; but the intense heat built up in the wok seals in the nutrients of the food, making for healthy eating. This dish has 245 calories per serving. Halve and thinly slice the onion. Prepare the mangetout. Peel and slice the mango. Heat the oil in a wok or large frying pan. Stir-fry the onion and coarsely grated ginger for 2-3 minutes until tender. Add the mangetout and prawns and fry for 1 minute. Add the mango, sherry and soy sauce and fry for 1 minute while mixing the cornflour with 1 tbsp water. Add the cornflour to the pan, cooking and stirring for 1-2 minutes, until the sauce thickens. Serve immediately, with freshly cooked rice or noodles. This recipe is good with mashed potato and baked tomatoes and courgettes. It is a healthy eating, low calorie 175 per serving. Preheat the oven to Gas mark 6 (200 degrees Celsius). Skin, wash and dry the fillets. Arrange them in a lightly oiled baking dish. Peel and finely chop the onion. Melt the butter in a pan, then add the onion and remaining ingredients. Mix well and spread evenly over the 4 fillets. Bake the fillets in the oven for 20 minutes and serve immediately. 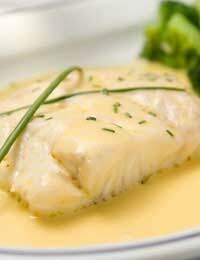 Monkfish features often now on healthy eating restaurant menus and is widely available from local fishmongers. It has firm, succulent flesh with a mild, sweet flavour and is an excellent and versatile fish. This dish has 160 calories per serving. Wash the fillets and pat dry. Rub a sprinkling of salt and the crushed peppercorns into each fillet. Heat the oil and butter in a frying pan and cook the fish for 10 minutes over medium heat, turning occasionally until well sealed. Add the stock. Cover and simmer for 10 minutes. Mix the arrowroot with 1 tbsp of cold water. Stir the mixture into the pan, along with the low fat cream and the brandy if using. Cook for a few minutes, stirring until thickened, then remove from the heat and serve.